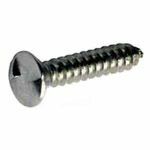 Clutch Head Security Screws are the original, low cost, one-way security screws that once installed are almost impossible to remove without drilling them out. 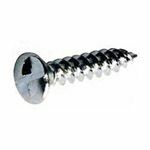 The screws are available in a range of materials including BZP and A2 Stainless Steel and are installed with a standard flat blade screwdriver. While no specialist tool is needed to install them, should you need to remove them, a special Clutch Head Removal Tool is available to help remove clutch-head screws that are manufactured from Stainless Steel. When using these Clutch Head anti tamper screws, you won`t need any special tools, as these screws are installed using a standard screwdriver. ...but if any attempt is made to remove the screw again, the anti-clockwise movement of the driver blade on the screw head, causes it to simply slip off the chamfered rear face, ...making it extremely difficult to remove the screw once installed. 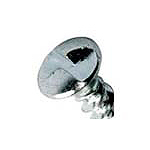 These low cost security screws are the original type of One-way Security Screw, which has been proven over many years. 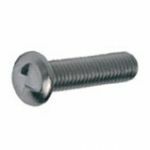 Clutch Head screws are available from stock - in a choice of; Woodscrews, Self Tapping Screws and Metric Machine Screws. 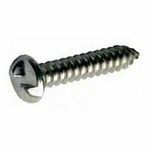 The Twin Thread Woodscrews are manufactured from Bright Zinc Plated hardened steel, the Self Tapping screws and the Metric Machine Screws are manufactured from Stainless Steel.